CHICAGO - The North American Association of Floor Covering Distributors (NAFCD) and North American Building Materials Association (NBMDA) will hold their annual convetion at the Hyatt Regency in Chicago from November 1-3 in 2016. 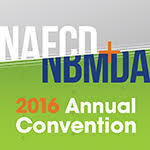 NAFCD and NBMDA unites the top distributors, manufacturers, and service providers from the floor covering, specialty building material, cabinetry, and woodworking industries to network, engage, learn, and grow their businesses. This is among the most anticipated and highly valued distribution-focused event of the year for suppliers to gain valuable access and deepen relationships with their distributor customers. Manufacturers and distributors set appointments with each other and use this time to form their operating and logistics plans, establish credit, and cover the critical factors that establish and strengthen their partnerships. Distributors in attendance at the convention are looking to spend time with their current suppliers and identify new lines to carry. Attending distribution firms represent approximately 900 distribution center locations throughout the U.S. and Canada. The Hyatt Regency Chicago is located at 151 East Wacker Drive, Chicago, Il, 60601.